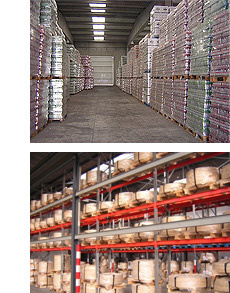 CIASA stores have a vast capacity and its structure and organisation facilitate stock management. The ambient conditions and rotation and traceability criteria can be managed to the advantage of the stores characteristics. - Intermediate and final poducts. - Shelves and piled up storage. - Standard EUR and special pallets. Bonded warehouse deposits are available since 1994. CIASA deals with the regulatory approval to receive, store and expedite products in the Manufacturing Special Taxes.